Cosmic Crown is a puzzle roguelike that takes its inspiration from acclaimed games such as Hoplite or 868-HACK. 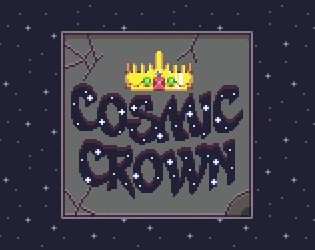 Taking place on in a corridor where you're only able to move upwards or downwards, the game is about taking your time and using your abilities intelligently to delve through increasingly complex (and randomly generated) corridors, with your final goal at the end -- the COSMIC CROWN. Play online here! Available for iOS, Android, and Windows Phone! 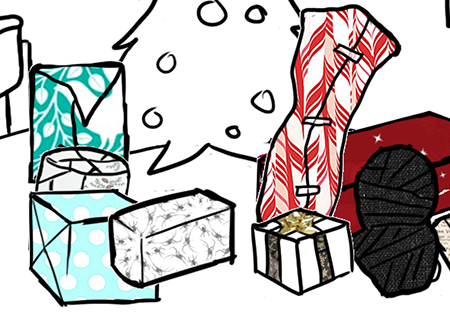 2:22am Made for the Something Awful Game Dev Competition in 2014. An unlisted broadcast late at night. Text And Drive : FRIENDSHIP NEVER DIES! 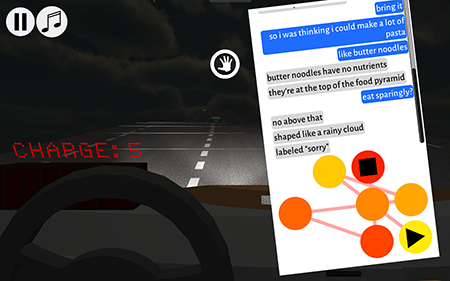 The acclaimed internet simulator is here to show you what is exactly up with all those squares telling you not to be distracted while driving a several-ton piece of metal at high velocities. 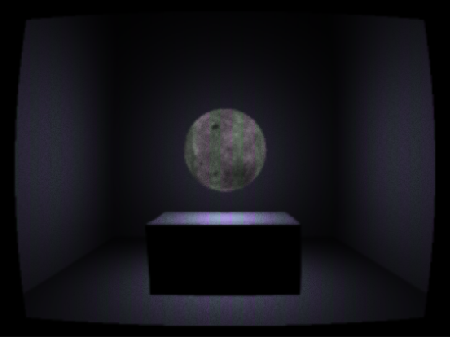 Pillar Planet is a matching game, presided over by a spooky eye underneath a baleful wallpaper sky. Fun for all ages! Out for Android, iOS, and Windows Phone! Christmas Presents attempts to capture the joy of opening presents on Christmas. Or at least what the television claims the joy of opening presents on Christmas is about. Seriously, the kid in this game has a dozen relatives, all of which are loaded. Cookie Shooter it's a thing I made over two weeks! 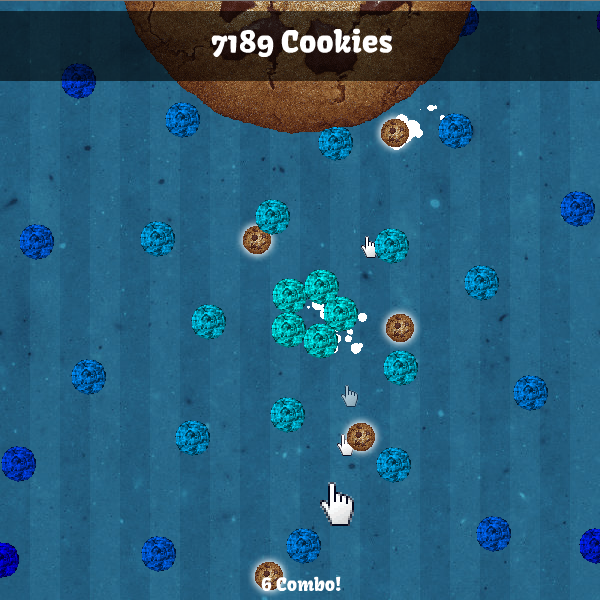 Combines cookie clicker-style upgrade mechanics with shmup / bullet hell inspirations. This is clearly a placeholder description. What do you do when you participate in a month-long contest, lose the first half to unforseen circumstances, then spend the last two weeks welding things together? You get this WarioWare-esque game where the personification of Death is trying to win the scaly hand of the personification of Taxes. A Date With Death is my own entry into the Something Awful Game Dev Competition, where creators had to create a game themed around "Death and Taxes" over the course of a month. It won second place judged, and fourth place in a popular poll! A version without sound also exists, if the one with sound gives you errors! Pond Scrum is the result of one day playing another arena shooter and wondering why all of them felt like Geometry Wars. A response to the "glowing abstractions on a black background", Pond Scrum has neither glowing, nor abstractions. In Pond Scrum the action focuses on bullet emitters that orbit your ship. There are three firing behaviors to choose from, and the emitters also change firing behavior when placed. Proper placement and switching of behaviors is key to surviving the tough, yet stagnant, still waters of Pond Scrum! Rumor says somewhere on the internet exists a document that details the mad thoughts of the creator of this game while he slaved away, cackling. Rumor says it's actually pretty pedestrian, and exists here. 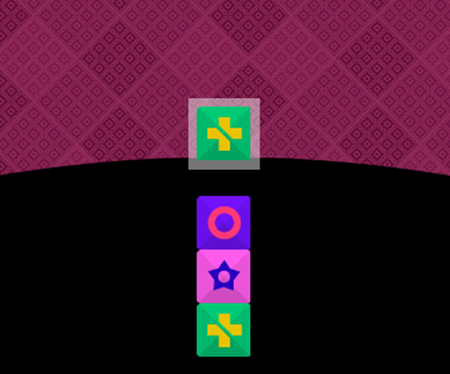 Inner Demons is based off of memories of Super Puzzle Fighter from when I needed someone's help to see over tall counters combined with much more recent memories of losing hours of my life to Puzzle Quest. I've also compiled a short essay on design decisions I made and why I made them in creating Inner Demons. A version without sound is available here. Anaglyph has you taking control of two protagonists, each only able to affect objects of one color. Figure out the way to the exit while conversing with the completely amiable, totally nonthreatening director! Anaglyph is a collaborative effort between Ken Squires and myself. This version is a proof of concept containing 11 levels. A Damask Proposal is a small classic shoot-em-up made early 2010. All bosses (except the first) attempt to challenge the player in ways that include, but also go beyond "here, please dodge all these bullets". This game draws inspiration from popular bullet hell games. It cannot be stressed enough, however, that there are no demon maidens in this game. As always, a version without sound can be found here. Avirnei is a squad-based RTS where the player commands only seven units. These seven units are chosen from a total pool of 12, with 4 units each in roles of "support", "offense", and "healers". Each unit can also be further customized, as the player can choose two units from a pool of three to complement the one innate ability that each unit has. Me and Kairos developed Avirnei over the course of spring 2008, submitting the final product to the IGF Student Competition in late fall of 2008. The version here is playable, but not finished, and exists in this state as an object for people to gaze upon, like something in a curiosity cabinet or a hunger artist.